Then something changed. Starting in the mid-1990’s, GDP growth uncoupled from fuel and electricity growth so that by 2010, energy productivity had increased to 116 $GDP/GJ, 33% higher than the average value it held throughout the 1980’s and early 1990’s. Moreover, this productivity increase was achieved even while significant growth in energy-intensive production and export of fossil fuels was taking place. Consider that between 1995 and 2010, the output of the Canadian economy grew by 46% but because of the improving energy productivity of the economy, the demand for fuels and electricity only rose by 12%. This 12% still amounts to 1131 PJ / year of new consumption, equivalent to all the fuel and electricity used in all commercial and institutional buildings in Canada in 2010. But without the productivity improvement, we would have needed to come up with an additional 3,246 PJ per year of new energy, an amount approximately equal to the total demand for gasoline, diesel and fuel oil in Canada in 2010. Of course we know that energy efficiency has generally been improving, but this is at best only half the story. An aggregate indicator like energy intensity masks a complex world of factors that are changing at different rates, for different reasons, and very often in opposing directions. To get at the underlying dynamics requires a model like CanESS, with its unique historical database, its ability to look forward and backward in time, and its detailed representation of end use technologies. Sectoral Differences: While energy productivity has risen in most sectors of the economy since 1995, in the mining and fossil fuel industries the fuel and electricity consumption per dollar of output has been increasing. Within the Residential Sector: While houses have been getting bigger and the number of people per house has been declining, these trends have been more than offset by ongoing improvements in the energy efficiency of dwellings. Within the Commercial and Institutional Sector: Improvements in the energy efficiency of commercial buildings since 1995 have been significant, but there has been an equal contribution to increasing energy productivity associated with the declining amount of floor area required per dollar of value creation in this part of the economy. Within the Freight Transport Sector: While trains and trucks are getting more efficient, trucks continue to win modal share from the more energy productive rail mode, and the total quantity of goods movement continues to grow. Within the Personal Transport Sector: People have chosen larger vehicles and drive them more, but since 1995, this has been more than offset by improved fuel efficiency of these vehicles. In the future, will the upward pressures on fuel and electricity productivity continue to dominate the downward pressures? Is it possible that they will accelerate as demographic, economic and technological trends combine with the ongoing substitution of information for energy? Where are the ‘pinch points’ in this huge and interconnected system, and how do they translate into opportunities for business and sustainability? It is important for both business and policy planning to understand the fuel and electricity markets, not only to anticipate and plan for changes in those markets themselves, but to identify and pursue the innovations that can help us get the amenities and services we need, while holding energy consumption to sustainable levels. These questions take us outside the normal boundaries of the business and public policies that relate directly to fuel and electricity production and consumption (or climate change mitigation) and into the broader economy where many underlying forces are at work to shape our energy systems. At CESAR, we are applying the data resources embedded in the CanESS model to identify and explore the rich and largely uncharted universe of insights and opportunities that come into view when we look beneath the surface and delve into the “secret life” of Canada’s energy systems. Effect of increasing oil price? Dave and Ralph - this is a very interesting piece. The main question I have is to what extent - if any - global oil price increases over the last 10-15 years (see http://www.wired.com/2008/05/oil-price-chart/) may have contributed to the increasing energy productivity? Thank you Marcus, this is a very interesting question, and one that we have been analyzing at CESAR. All else being equal, a real price increase in oil will have a positive impact on aggregate energy productivity, but is lower than you might think due to moderating factors. First, notwithstanding the importance of the fossil fuel production industry (oil and gas) to the Canadian economy, and especially its contribution to the nation’s trade balance, its direct contribution to GDP in 2010 was about 4.5%, only part of which is generated by oil production. 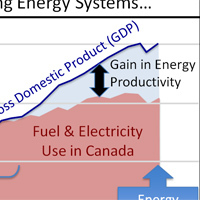 So a doubling of the real price of oil would, all else being equal, increase Canadian energy productivity by only 2-3%. Secondly, we measure Canada’s energy productivity in Canadian dollars of GDP per unit of energy consumption, and while the oil price was going up (as established in US dollars), the Canadian dollar was rising against the US dollar. This further dampens the energy productivity increase due to oil price increases. In addition the price of Canadian oil is discounted and WTI crude price increases have been higher than for Edmonton par. Oil production accounts for a much larger share of Canada’s fuel and electricity consumption than of GDP, and so aggregate energy productivity is more sensitive to changes in the energy intensity of oil production than to changes in crude prices. Over the past 20 years, the growing share of the relatively energy intensive oil sands production, as well as the increasing energy intensity of conventional crude production, have had a much larger (and negative) influence on Canada’s aggregate energy productivity than the smaller, positive influence of rising oil prices.